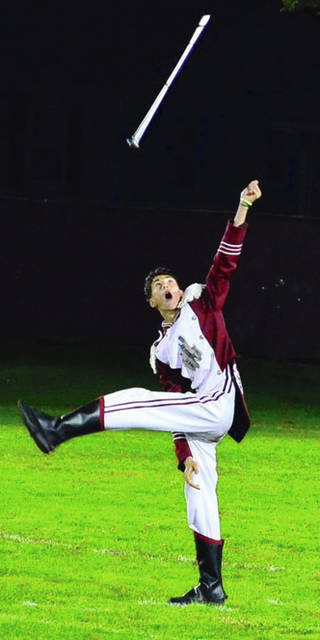 UHS Drum Major Frank Haimerl is pictured during a performance this season. Alumni will join the current high school band for Homecoming events this week. The UHS band and its alumni members will help celebrate Homecoming this week. The Urbana High School Alumni Band is currently making plans for its annual homecoming reunion this week. 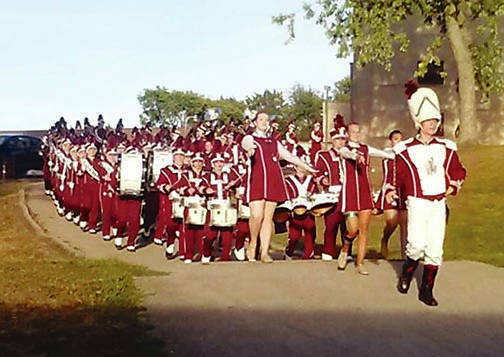 Alumni of all ages who were members of the UHS Marching Band are invited to participate in a variety of activities, including the homecoming parade and the pregame and halftime shows at the homecoming football game. Meet outside of door #6 at Urbana High School at 6 p.m. Bring your instrument and a folding chair to ride the float, provided courtesy of Wreck-A-Mended of Urbana. Please arrive early if you need music. The parade steps off at 6:30 p.m. and will end back at the school. Alumni are welcome to attend the community pep rally to follow the parade. Meet in the old band room at 5:45 p.m.; enter through the back door of the old auditorium building. For halftime, the combined UHS Marching Band, UJHS Band, and UHS Alumni Band will perform an OSU-themed show, featuring Script Ohio. Alumni are invited to attend rehearsal on Wednesday, October 3, or Thursday, October 4, from 3-4 p.m. on the practice field at East Elementary. Those unable to attend a rehearsal must RSVP if they plan to participate in the game. “We are excited to continue this tradition with the alumni of the UHS Band,” said Matthew Smith (tuba ’00), who is organizing UHS Alumni Band activities, along with Angelika (Roberts) Paxman (trumpet ’84) and Nichole (Huffman) Courtaway (’01). “It is always a pleasure to receive the invitation from director of bands David M. Sapp to join together to march once again with the UHSMB,” he added. Alumni are welcome to participate in any or all portions of the activities that are scheduled. Those who are not physically able to march are still welcome to join the band for the parade and to play from the sideline during portions of pregame. Alumni are also reminded to visit the UHS Alumni Association during the homecoming game to renew their membership. Music is available from the UHS Band Office or on the www.facebook.com/uhsalumniband. Those participating are asked to wear blue jeans and school colors to both the parade and game. For more information, or to RSVP, please contact Paxman (215-5529) or Courtaway (508-7197), or contact the band office at 653-1422. Information from Urbana High School Alumni Band.